According to the payroll jobs report today (March 6) the economy created 295,000 new jobs in February, dropping the rate of unemployment to 5.5%. However, the BLS also reported that the labor force participation rate fell and the number of people not in the labor force rose by 354,000. In other words, the unemployment rate dropped because the labor force shrunk. If the economy was in recovery, the labor force would be growing and the labor force participation rate would be rising. The 295,000 claimed new jobs are highly suspect. For example, the report claims 32,000 new retail jobs, but the Census Bureau reports that retail sales declined in December and January. Why would retailers experiencing declining sales hire more employees? Construction spending declined 1.1% in January, but the payroll jobs report says 29,000 construction jobs were added in February. Zero Hedge reports that the decline in the oil price has resulted in almost 40,000 laid off workers during January and February, but the payroll jobs report only finds 2,900 lost jobs in oil for the two months. There is no sign in the payroll jobs report of the large lay-offs by IBM and Hewlett Packard. These and other inconsistencies do not inspire confidence. By ignoring the inconsistencies the financial press does not inspire confidence. Let's now look at where the BLS says the payroll jobs are. All of the goods-producing jobs are accounted for by the 29,000 claimed construction jobs. 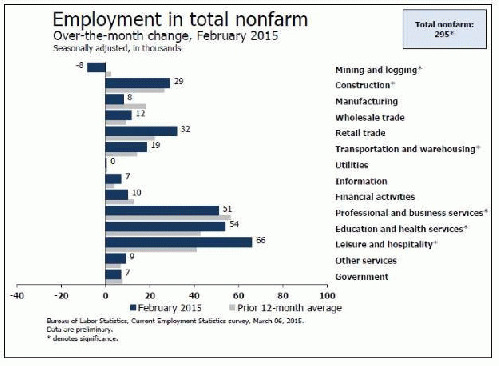 The remaining 259,000 new jobs -- 90% -- of the total -- are service sector jobs. Three categories account for 70% of these jobs. Wholesale and retail trade, transportation and utilities account. for 62,000 of the jobs. Education and health services account for 54,000 of which ambulatory health care services accounts for 19,900. Leisure and hospitality account for 66,000 jobs of which waitresses and bartenders account for 58,700 jobs. These are the domestic service jobs of a third world country.